When it comes to the Mail app on Android, most of the people rely only on a Native email client that OEM put it or Gmail app which you download from Play Store. Gmail app is a perfect app when it comes to functionality and its my favorite app but the UI of Gmail app is not that attractive. If you want Mail client with beautiful user interface both in Phone and Tablet and multi-account support or if you’re using the native email client than its time to make a switch. Try a new myMail Email client for Android. 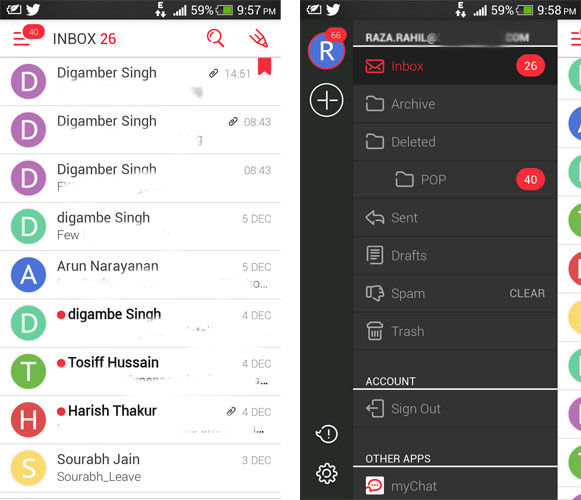 myMail is the email app for Android with simple, bright and friendly interface on both Phone and Tablet. myMail currently support Gmail, Yahoo!, AOL, iCloud, Hotmail and Outlook mailboxes. It means the mail client is perfect for most of the users. When you start myMail, it’ll ask you to choose the mailboxes you want to connect. After supply login credentials, you’ll redirect to the Inbox. On the homepage, you’ll find Menu on the top left from which you can access other settings using sliding menu, Write mail button on the top right and search button next to write button. From sliding menu, you can access to other folders of your email such as Archive, sent, draft, spam, trash. Also you can add more account by tapping on plus button. While reading mail, you can navigate to other mail by pressing forward or backward button. Also from the mail screen, you can forward, reply, hit spam or delete mail from bottom action bar. Good things about my mail is that it’s written in native code, your data is always encrypted and most important the app is optimized for both the tablet and Smartphone (I’m sure Tablet users will like it). The app also supports push notification, you can turn on, off or filter notification. Filter notification is very useful those who don’t want social notification. You can set a time when you don’t want to receive push notification from settings. The privacy feature in the notification will hide the sender or subject of the notification. Personalized your Inbox with your friends avatars and icons. myMail is a free email app for Android, optimized for both Smartphone and Tablet. The app requires Android 2.2 and up. Go and try this email app if you’re still using the native mail client. Download the app from below widget.